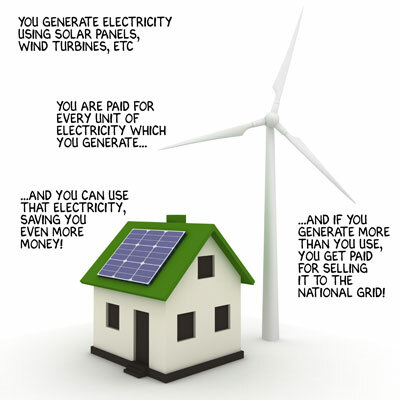 The Green Deal is an initiative being planned by the Coalition Government which will operate across the housing and commercial property sectors in the UK, it is part of the wider The Energy Bill 2010. The UK Government has developed the idea of the Green Deal as a way to address the current lack of investment in energy saving measures in both domestic and non-domestic property. It attempts to encourage home owners to consider making their homes greener, the scheme will enable those interested to take out a special loan in order to carry out work like loft insulation or solar panels etc. The loan would not be attached to a person but to a property and would be paid back through the savings such work would provide. Instead, payments for the improvements will be recouped through a charge in instalments attached to the customer’s energy bill and repaid over a number of years. The relevant energy company will be responsible for collecting repayments through energy bills and passing it on to the appropriate organisation responsible for providing the finance. As such, this is not a conventional loan and is attached to the property and the person responsible for paying the energy bill. This will mean that the obligation to pay the loan will pass to the new occupier or bill payer if the current customer moves on. The Bill is in its last stages going through parliament and is expected to become effective at the end of this month (Oct 2011) while the actual implementation of the bill or seeing the first “Green Deals” will, it is estimated not to start until October 2012 at the very least. The law will apply to the whole of the United Kingdom and will not see the devolved areas needing to administer the scheme within their area. Home owners, housing associations and others across the UK will be able to take advantage of the opportunities presented by the Green Deal, once it becomes available. Any Green Deal will commence with an assessment of the property and recommendations for measures for improvement. This assessment will be undertaken by an accredited Green Deal Assessor, prior to agreeing a formal Green Deal Plan with a Green Deal Provider. It is proposed that a Green Deal Plan will include the detail of the energy efficiency improvements to be made, the installation itself and the financial package that supports it. The Green Deal provider will be responsible for all aspects of the Green Deal Plan including arranging the installation, the finance package and warranties for products and services. 2 By 2018 the minimum standard for any PRS property that is let must be E (unless a Green Deal has been taken out, all possible measures installed and the property still falls below E). These improvements must have occurred by 2018 and 2018 is the end point/deadline not the starting point. DECC Youth Advisory Panel write to Chris Huhne at their disgust of the news that the Solar Feed- in -Tariff (FiT) is to be cut in half Decc – MY2050 -Can you balance energy supplies by 2050 ?